Women almost love their clothing more than anything. So when our favorite apparel gets stained or damaged, it can become an extreme frustration. 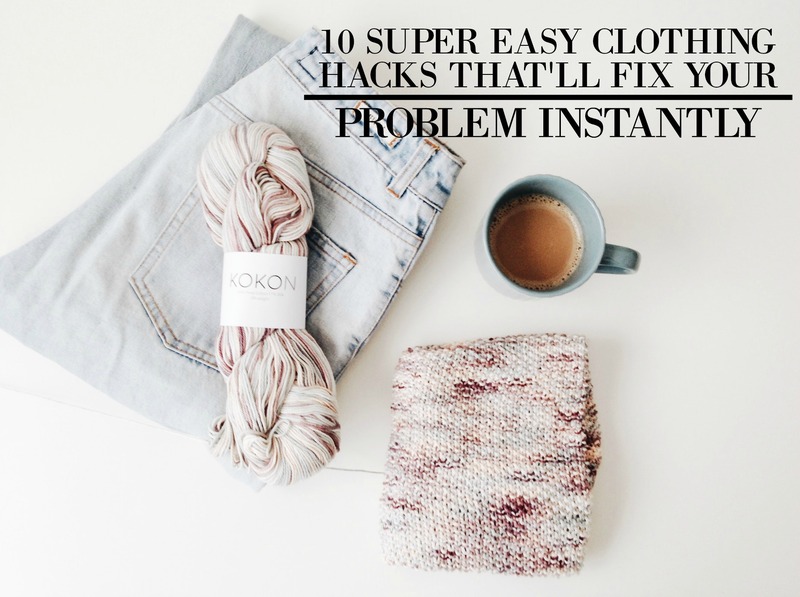 But thankfully you don’t have to worry because today I’m going to give you 10 super easy DIY clothing fixes that’ll make your favorite attire wearable once again. Let’s check it out! If your zipper is stuck all of a sudden, rub some crayon on each side, and it’ll instantly come loose. Just keep in mind that the crayon has to be the same color as the zipper. You can even use Vaseline instead of crayon to follow the trick. This one is an amazing hack. If you have pilling on your favorite clothes, you can simply use a razor to get rid of them. You have to lay down your apparel and use a razor on a flat surface to shave them off. How to fix torn jeans. Nowadays, torn jeans are in fashion. But, if you want to fix it up, simply patch up any unusual clothing item to highlight the tear. Try to do it with denim; it’ll add some fun to your pants. Do you have a tear in your stocking? We love out tights, but sometimes we have to put up with tearing. It’s unacceptable, isn’t it? Even if you wear them for the first time, you may have to face this. But don’t worry, because we have a quick solution for this. You can simply apply your clear nail polish to stop spreading it further. How to use pumice stone. If you have fuzz on your desired coat, you can use a pumice stone to get rid of this. It’ll make your coat brand new by removing the little pieces of fuzz. Baby powder is really helpful for this. It removes all of the oil stains from your clothes. You just have to put some baby powder on the oil stain and keep it on overnight so it can soak up the nasty oil. In the morning you’ll be amazed by its result. How to exclude makeup smudges. If you notice a stain or makeup smudge on your clothes, grab shaving cream to remove it. You have to rub the shaving cream on it until it disappears. If it’s a stubborn stain, repeat the process a few times. How to fix sweater snags. People usually get sweater snags by accident. But all you have to do is use a latch hook need to drag it underneath the fabric. How to utilize safety pins to reinsert a drawstring. If a drawstring comes out, it’s hard to get it back in the previous place. But it’ll won’t happen anymore because you can reinsert a drawstring by using a safety pin. Just attach the safety pin at the string’s end and pull it back. It’s super easy to do! How to fix your button? Missing buttons on your favorite sweater or shirt, probably annoys everyone. But you can seal the button by placing clear nail polish on the thread of the button. You’ll never lose the buttons of your shirt again. If your favorite attire is suffering, then definitely utilize these super easy DIY clothing hacks. They’re super easy to do and will save you a ton of money! Now if you have any questions, feel free to ask in the comments down below. I’d love to help you out!